Top Banks of India: ICICI Bank's Real Turnaround Still Away? There is nothing more sacrosanct than quarterly results. It separates the listed from the unlisted entities, the men from boys. Because, the latest quarterly results increases or decreases that revered number – TTM EPS – or trailing twelve months’ earnings per share, the ultimate metric that shows the investors what they are getting for their investment. Take for example ICICI Bank. For the quarter ended September 2009, ICICI has come up with impressive numbers. Operating profit was up 18% QoQ and 6%YoY, net profit was up 2.6%, net interest margin (NIM) was maintained at 2.5%, net NPA was down 6.2%, and CASA deposit percentage was up to 36.9% from 28.7%. On the whole it comes out as solid results. Even the stock markets reacted favourably, for a couple of days. 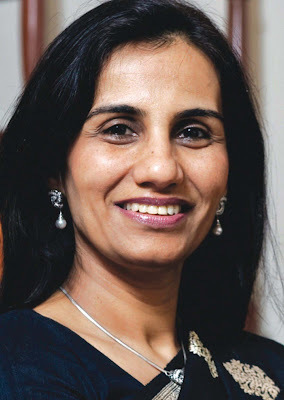 Chanda Kochhar even began hoping for a bonus for her hardworking team this year. In 2008-09, they had missed their bonus, while at the end of 2007-08, then CEO & MD KV Kamath had been paid Rs. 43.24 lakh, while Kochhar reportedly was paid Rs. 22.44 lakh. But a look at the quarter with more realistic glasses, yields a different set of results. Total income fell 12.7%, fee income declined 26%, loans contracted 14% YoY, net interest income was down 5% YoY, and ratio of net NPAs to loan assets rose from 1.9% to 2.36%. More interesting are the positive numbers of net profit and CASA deposits. Headline profit was up mainly on a huge relative growth in treasury income, compared with Q2 of 2008-09. Then treasury was at a loss of Rs. 153 crore, while this time it posted a profit of Rs. 297 crore. And the real reason why CASA percentage rose was this – its total deposit base shrunk by 11.45%. Not that ICICI Bank did any jugglery on these numbers. Anyone in their position would highlight the good figures and downplay the bad ones. But what matters is the way different media has opted to cover the numbers. There was a core message in the real numbers of ICICI Bank, and it was this – the planned turnaround hasn’t started delivering in their core businesses. Even worse is the impact the new provision control ratio (PCR) will have on ICICI Bank’s bottomline. The estimated Rs. 1800 crore extra provisioning required by the bank to meet the 70% PCR can wipe out around 35% of its current annual profits, some reports say. ICICI Bank’s is not a lone case as far as confusing quarterly results is concerned. The media and the markets want to project the good side of friends. But the fact that, in India, quarterly results are still unaudited should be another cause for concern. Because of this, developed markets have started looking at EPS with suspicion, and instead looking only at Cash EPS, and the corresponding P/C, instead of P/E. Not that Cash EPS can’t be tampered. It is difficult and would take a concerted Satyam like effort.